Ice cream or popsicle as a remedy for headaches and anxiety? Sounds like a dream, but we made it a reality for you! During hot summer days we crave for a refreshment, and nothing can be better than eye-catching homemade popsicles, made with fresh lemon, blueberries, honey and a secret ingredient, lavender. Lavender is a magic flower, and not just because off its appealing purple color and unique aroma. It is also an effective remedy for headaches, migraines and anxiety. We designed a special summer recipe for you, which combines a refreshing and aromatic taste of lemony lavender together with its medicinal properties. The best summer treat you can imagine! Step 1. Cover dry lavender water with hot water and let it sit for 15-20 mins. Step 2. Squeeze lemon juice into the jar with lavender and water. Step 3. Add honey to the jar. Be careful and make sure that water cooled down enough – honey should not be added to water which temperature is above 42 degree C. Stir the mixture nicely. Step 4. 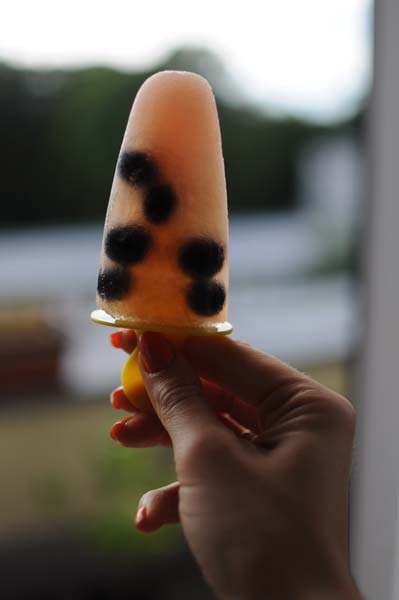 Take popsicle moulds and fill them up with blueberries, as much as you like. Pour lavender mixture into the moulds through the strainer. Step 5. Freeze for at least 4 hours. Enjoy your popsicles on a hot summer day, as a remed for headache or just for its delicious taste!